Of all the organizations that are jumping on the OTT bandwagon, you might not expect to see newspapers. Yet that is precisely what is driving innovation at Calkins Media, a legacy media company with new media ambitions: hence Calkins Digital, which advocates video streaming for local media companies to “remain relevant”. A short four years ago, Calkins was primarily print. Then they started to invest in teaching their people video production skills: arming reporters with iPhones, and training them to shoot and edit. Calkins started offering reporter videos, cooking shows, newsroom updates, and the occasional news show “package” – all sponsored. 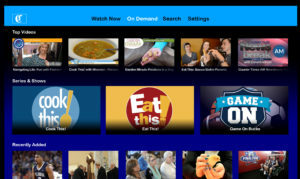 Comcast has included Calkins Media videos on its local Xfinity On Demand service. Linear channels are not an easy task for newspapers to undertake, without a broadcaster’s knowledge and equipment. “That’s when we identified TelVue, about three years ago, when we started to evangelize linear video feeds for our news operations,” says Tasaka. Vyas says it was impossible to ignore the spectacular growth of video consumption. “All the data says that is the direction to go in. For us, TV solves the readership problem.” Yet, Calkins didn’t want to go into the hardware business, and for them TelVue’s Virtual HyperCaster was the solution. The Virtual HyperCaster is a cloud-based broadcast server that includes all the linear scheduling and content management tools of the regular HyperCaster, without the need for broadcast hardware on the client premises. Everything is managed in TelVue’s Hosted Broadcast cloud. Within the past year, Calkins has launched fifteen OTT channels that deliver hyperlocal news to the home TV: The Bucks County Courier Times, Wochit, and WWSB, all of which are available on Roku, FireTV, and Apple TV. There are plans to launch more linear channels from Calkins’ Philadelphia properties.